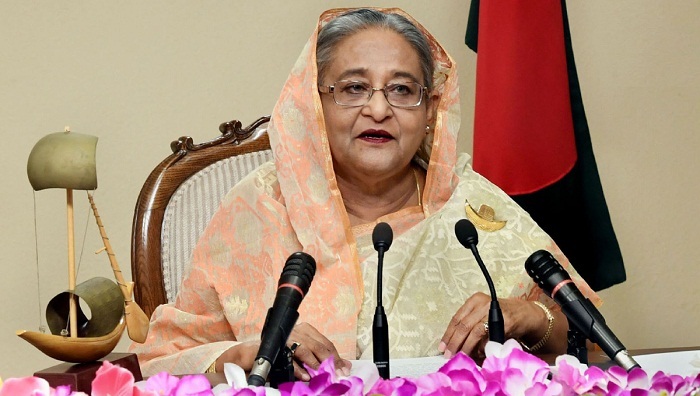 Prime Minister Sheikh Hasina on Tuesday stressed the need for a greater campaign to make people aware about taking nutritious and balanced diet for preventing diseases. “It’s essential to conduct a larger campaign so that people take nutritious foods and balanced diet. We’ll have to give a special importance to preventive measures so that they aren't affected by diseases,” she said. With the slogan 'Shashtthya Sebar Odhikar, Sheikh Hasina-r Ongikar’ (To ensure right to health services is the commitment of Sheikh Hasina), the National Health Services Week is being observed for the first time in the country. The Prime Minister said her government has focused on ensuring food security so that people take nutritious foods. "Today, Bangladesh is self-sufficient in food production," she said. A video documentary was screened focusing on the country’s health services at the function. Health and family Welfare Minister Zahid Maleque chaired the function. State Minister for Health and Family Welfare Dr Murad Hasan spoke on the occasion as special guest. Health Services Division Secretary Md Ashadul Islam delivered the welcome speech.